Hello faithful Blu-rayDefinition readers! We are happy to bring you the opportunity to win a copy of the action-packed adventure 14 Blades starring martial arts legend Donnie Yen that our own Brandon DuHamel said was “Filled with lavish costumes, nonstop action, and gorgeous cinematography”on Blu-ray Disc. We have two copies up for grabs, so enter now for your chance to win one. See below for details and how to enter. Live By Your Own Laws. BEVERLY HILLS, CA – Anchor Bay Entertainment and RADiUS-TWC are proud to announce the arrival of the action-packed blockbuster 14 BLADES on DVD and Blu-Ray™ September 2, 2014. 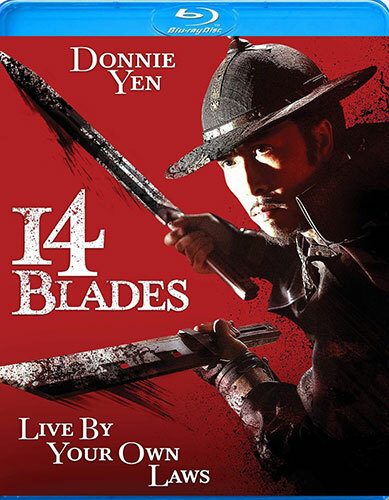 Starring Hong Kong superstar Donnie Yen (Ip Man, Hero, Iron Monkey) and featuring mind-blowing choreography, exotic locations and lavish costumes, the award-winning 14 BLADES is not to be missed! Qinglong (action icon Donnie Yen) is a legendary royal guard-trained in a clandestine form of combat from childhood in order to devote his life and lethal prowess to the service of the Emperor. When the Imperial Court is taken over by an evil traitor, Jia (Law Kar-Ying), and betrayal lurks at every corner, Qinglong finds himself hunted by those he once trusted. Now as the most wanted man in the land, he must seek out and rally the loyalists to rise against Jia and restore the Emperor to his rightful place! 14 BLADES has a run time of 113 minutes and is rated R for violence and bloody images.